Wow, August is flying by!! Today is the 21st, already! 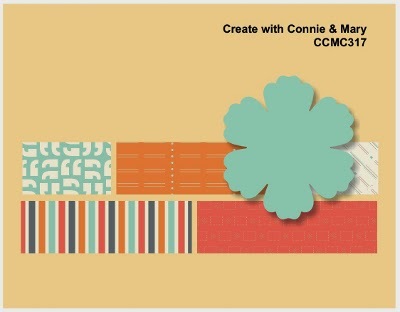 We have a fun sketch challenge this week at Create with Connie and Mary and it's an excellent way to use your washi tape or small pieces of DSP left from larger projects! I used strips from the Confetti Celebration DSP for the sketch lines. For the focal point, I diecut Brushed Gold cardstock with the filmstrip framelit from the On Film Framelits set. (Whew, that was a mouthful!) I cut Vellum cardstock to adhere behind it so the DSP could be seen through it... kinda like film? 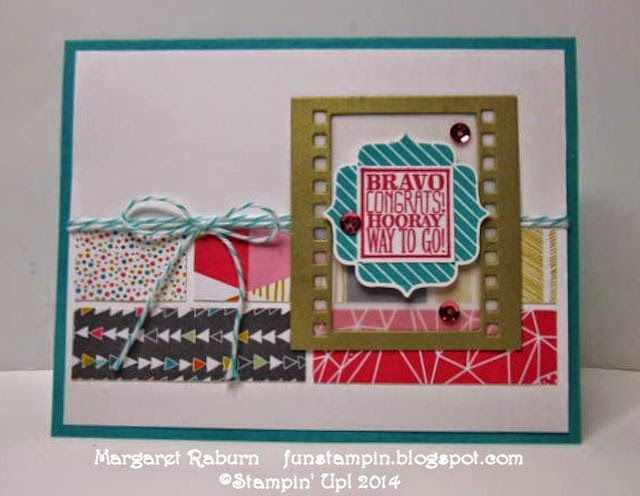 I pulled in the Bermuda Bay and Strawberry Slush colors from the DSP and cardstock to stamp the layered greeting. I sure like that this set has more than one greeting to layer on this striped background, plus, you could use other small greetings, like those from the A Round Array set to layer over this background. The label is punched out with the Label Bracket Punch and the greeting with the 1" Square punch. So easy! Paper: Confetti Celebration DSP; Bermuda Bay and Whisper White cardstock. Vellum Cardstock. Accessories: Oh Film Framelits, Label Bracket Punch, 1" Square Punch, In Color Sequins, Bermuda Bay Baker's Twine. Follow this LINK to Create with Connie and Mary to see what the other designers have done with this sketch; they have some wonderful ideas and projects!! While there, check out the guidelines for joining the sketch yourself! It's fun to see what wonderful yet different projects that the challenge players come up with too! We want to see your creations!! Thanks for visiting my blog! You are appreciated! Oh this is so pretty! I love all of the layering and the brushed gold frame with vellum. Great idea! What a great way to use up paper scraps! I really like all the different patterns on this card...wouldn't do it with many other designs, but is just works with this one! Great card! Love the vellum behind the filmstrip! Clever!! Your dsp strips really work perfectly together! Love it! Great use of scraps! 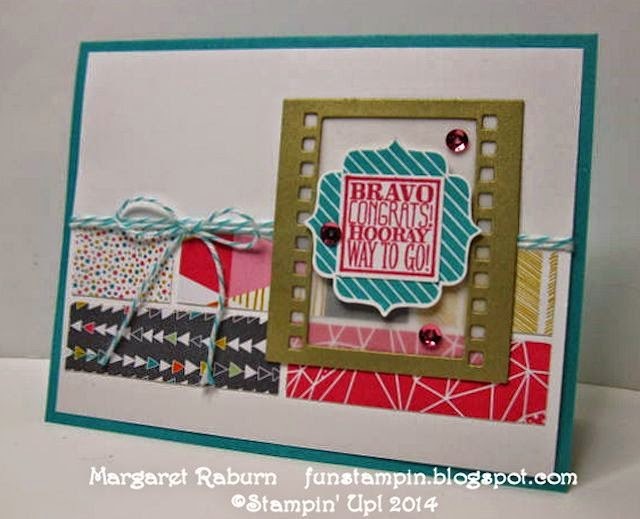 Didn't even realize they were scraps when I first saw your card, Margaret! Way cute filmstrip die with your vellum inside it! Thanks for sharing! Awesome card! I love the film as the backdrop for your sentiment!! Love the shimmery gold frame around the sentiment - a fun and colorful card! The Filmstrip die is perfect for this focal image...such a wonderful card! Great job with the sketch this week! Do U Speak Flamingo Lingo?